Picking sleep out of my eyes, ruffling my bed hair and negotiating my slippers, I shuffled to the kitchen and made myself a cup of coffee. The morning silence broken only by the sound of the swifts catching their breakfast. What was I going to ‘catch’ for my Sunday breakfast? I didn’t fancy toast; anyway I’d forgotten to take the butter out of the fridge last night and even though I had some smoked salmon that would have been lush with scrambled eggs and smashed avocados, I didn’t fancy that either. And then it hit me… lemon madeleines. I know, I know, only I can go from toast to baking madeleines as my alternative breakfast at 8am on a Sunday morning! Anyway, once I had the idea in my head there was no turning back. 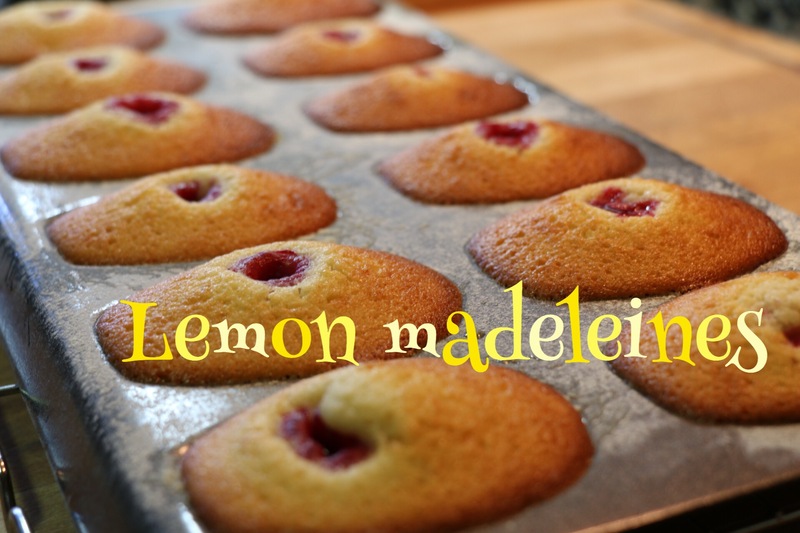 Madeleines are ridiculously easy to make, as can be seen in the clip below. Still in my PJ’s I set about preheating the oven and weighing out the ingredients. Mix everything together and let the lemony batter rest whilst the oven comes up to temperature. …the raspberries make it one of your five a day…don’t they?! Note: even though madeleines are very easy to make (and even easier to eat!) I wouldn’t necessarily want to make these on a work day where you’re generally following a regular morning routine and you’re up against the clock. Maybe having the batter in the fridge from the night before and the minute you wake up turning the oven on might be too organised even for me! The recipe is perfect for morning shuffling, plodding around the house, listening to your favourite radio station; waking the house up, slowly.